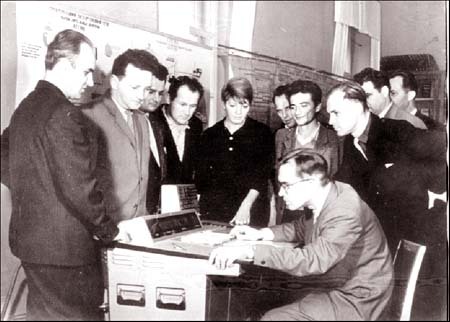 Victor M.Glushkov at the control desk of the computer "Promin" . In the 1959 V.Glushkov proposed the work program to create the machine for the engineering calculations. It started from the development of the model for the digital calculating automata MIM. In the 1963 designing work was finished and serial production of the first computer of such type - "Promin" had begun.